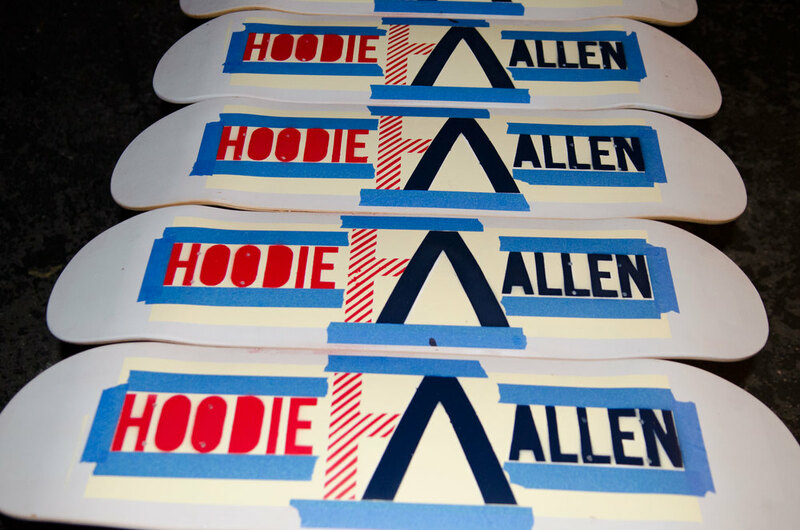 In the spring of 2012 I made one Hoodie Allen Skateboard Deck in anticipation for his upcoming album All American. Once completed I email a picture of it to Hoodie to see if there was any way I could mail it to him for him to sign and he could then mail it back. He responded yes, and asked if I would make one for him as well, so of course I did. 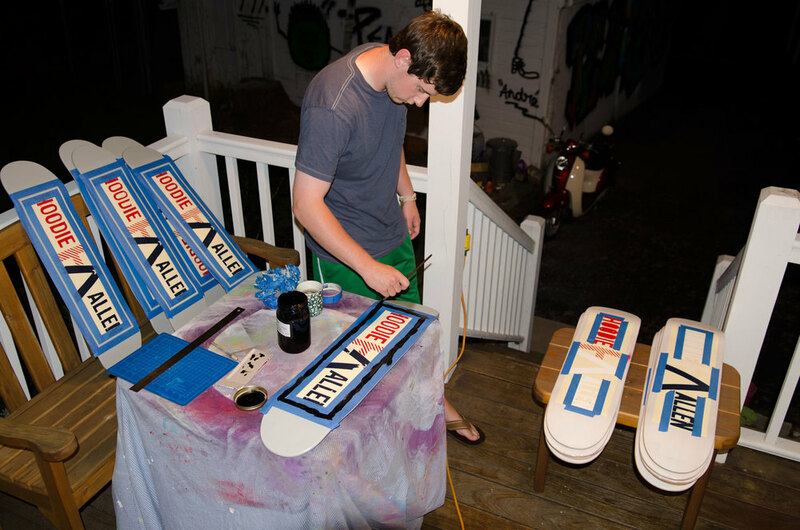 I sent the two boards off and once Hoodie received it he posted a picture of it on Facebook asking his fans who would want one. The fans responded positively to the image and received thousands of likes in a matter of hours. 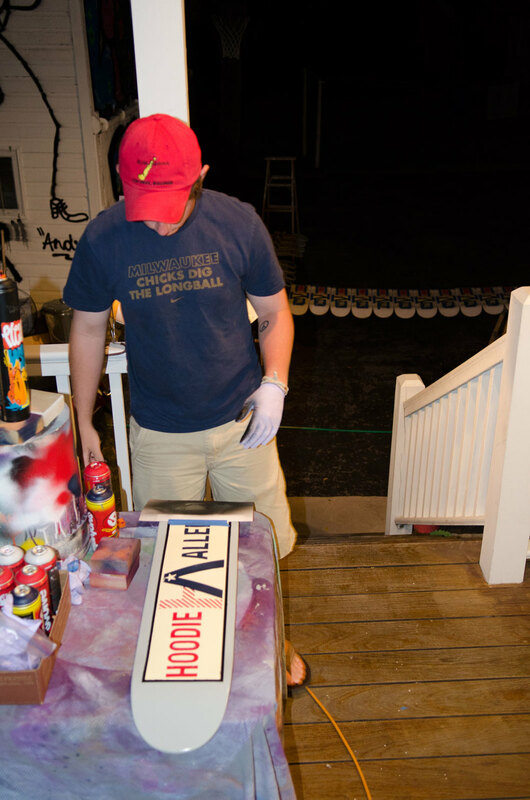 Hoodie and I then begun talking about doing a limited run of hand-painted boards that he could sell to his fans. That summer I set up shop and produced 25 decks in about a months' time, selling boards across the United States and even across the world to Australia. The process for each board I decided to lay out in stages, doing all of the boards at once instead of one by one. Each board was created with a total of 24 stages from start to finish. The text was created by hand cut stencils and sprayed with spray paint, the rest was painted on with a brush. I sealed each board 3 times with polyurethane to give it maximum durability in case the buyer decided to use it as more than a wall decoration. Later in the fall I had the opportunity to go to a Hoodie Allen concert and was able to meet him and talk a little. I can't thank him enough for giving me this opportunity to showcase some of my artistic skills.